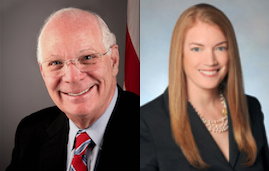 Senator Ben Cardin and Julie Hopkins of Tydings & Rosenberg LLP appeared on the AHA Business Radio Show Tuesday, February 17th. Click to hear the conversation about the Maryland Consumption Tax and Trademark/Patent Law. Don’t forget to tune in to next week’s show at 6:00pm on 1300 WJZ-AM CBS SPORTS RADIO!